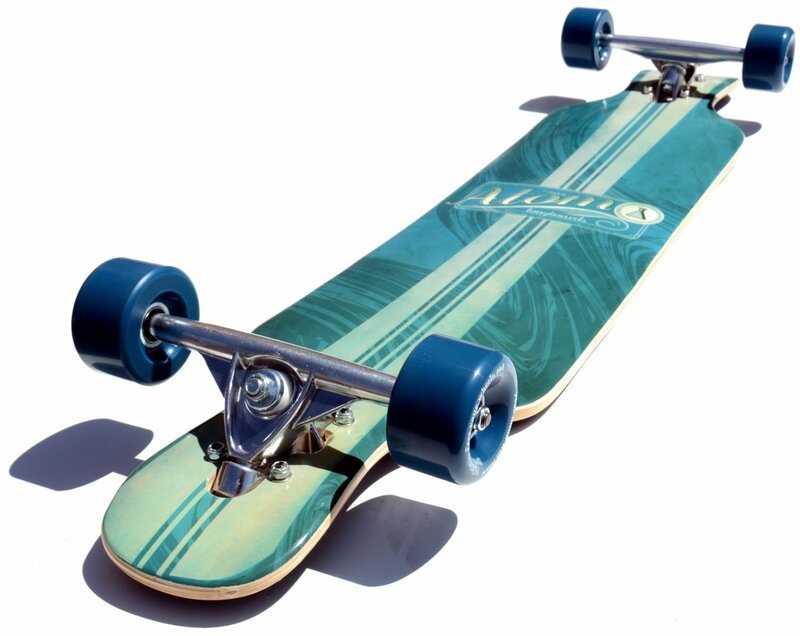 Hey guys, I’m a new writer for Rideasf.com so for my first article it’d only make sense to review my all time favorite board – the landyachtz evo. 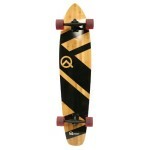 This deck is one of the best beginner downhill boards. 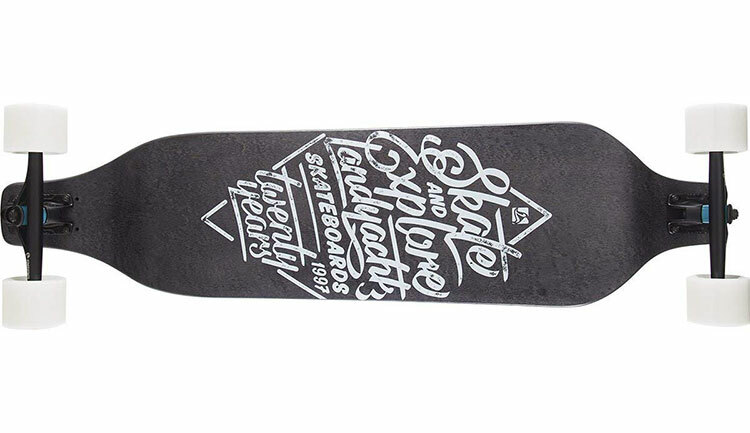 Made with 11 plies of Canadian maple, this deck is rock solid; and you know you can trust the guys at landyachtz to make an awesome deck with a quality that won’t disappoint. If you’re looking to get into racing, or just like going really fast keep on reading and find out what makes this deck so great. This is my favorite board for many reasons, and I’ll cover all of them. I’ve been riding this deck for 2 years now and I absolutely love it. Sometimes other boards will join my quiver and take its spot for a while, but it always comes back to the evo. I own the 2013 version, which was made with the new mold – the one they use now. Prior to this, in 2012, the evo was 41” long, way too long for most riders. With a 24.5” standing platform the evo feels great, my stance covers most of the board (I’m 6’) and it doesn’t feel like there’s much wasted platform. The first thing people notice apart from its weird shape is the wedging. Yes, the necks are angled like that for a reason, and a good one. The built-in wedging on the evo effectively wedges your front truck 15 degrees and de-wedges your back truck 15 degrees. The wedging in the front adds turn to the truck, while the de-wedging in the back adds lean – the result is increased turning in the front and increased stability in the back. This also means that the evo can only be ridden one way, forget about riding switch with it. Don’t be turned off by this, the slalom and downhill crowd have been riding directional set ups like this for a decade, though it means you won’t be able to set it up with just any truck (this is something I’ll cover later). In the world of downhill, riding switch doesn’t really matter, what matters is going fast and being stable. The concave of the landyachtz evo will make you feel right at home, it’s by far one of the comfiest I’ve tried. The tub concave follows the rails. The concave is mellow enough to not feel like it’s getting in the way, but aggressive enough to keep you in place. You’ll notice how the rails recede towards the back, this is great for tuck positioning – your front foot will fit entirely on the front and you’re your back foot will be lined right against the rails. You won’t need to move your feet at all once you’re in tuck, the rails and the drop will keep your feet nice and locked. The deck also features large wheel cut outs, this means you won’t have any problems running your big wheels. +70mm wheels will not have any problem with wheel bite, I’ve tried 78mm wheels on it and still no wheel bite, and I run a pretty loose bushing set up. Another cool thing about the evo is that it is a raked deck; this is something you don’t see very often. The front pocket is actually lower than the back, this combined with the already massive 1.4” drop will make you feel very stable going fast. I wouldn’t recommend getting this deck complete just because the stock set up isn’t very good. There are plenty of other options that will make your evo feel way better. This deck was originally designed to take Randal DH 160mm 35º which would make it 50 º up front and 20º in the back. 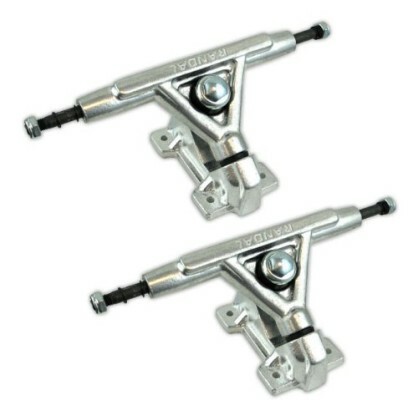 This is the prime set up for an evo, but there are other trucks you can set it up with. Be warned however, anything over 45 º is going to feel terrible to have as a front truck; all those trucks with 50º base plate angle (which are most) won’t work well with the evo. The highest degree base plate you can run and still feel good is 45º, it’d get wedged to 60º which is pretty high, but it still turns alright. Some truck recommendations would include Sabre (but with either the old 45º base plates or the forged precision 38º base plates), Randal RII with 42º plates, Bear 840, cast Ronin and of course Randal DH. You can also buy the base plates separately and toy around with your set up, but only do this if you know what you are doing. You might also want to stay away from un-raked trucks like caliber, charger II or gunmetal, un-raked feels really dead after the 15º de-wedge in the back. As for wheels, most large downhill wheels will feel great on it. Stay away from rounded lips and give sharp lips a try. Venom’s 72mm Cannibals are a community favorite for downhill, and mine too! 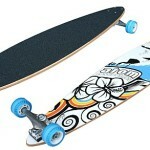 Soft wheels will be better to roll over chundery roads and maintaining grip so you can rail turns. I wouldn’t recommend anything over 80a. This deck is great for anyone looking to get into downhill. It’s very stable and comfy, so it will help you get the confidence needed to shred the faster runs. With 11 plies of rock hard Canadian maple, this thing will take anything and everything you throw at it – it will, without a doubt, outlive any other deck in your quiver. It’s downhill specific, so you can’t do much of anything else on it except cruising. So, what you think about Landyachtz EVO? You also have writing skills? Share your longboard expierence with us. We pay you! Click HERE and read more.